Most people think that a garden is simply a piece of land with beautiful ornaments, blooming flowers, and a few vegetables to harvest. But when you think about it, there’s actually more to a garden than meets the eye. In fact, there are gardens that are made specifically to help you survive any potential disasters or catastrophes. Start by planting easy-to-grow vegetables like peas, beans, carrots, and potatoes. Growing calorie-rich crops like squash, corn, and sunflower seeds is a great idea, too. If you want your vegetables to last all winter, you should plant ones that store well, like beets, turnips, carrots, kale, onions, and leeks. One of the best ways to make your home self-sufficient is by growing your own medicine. One of the must-have medicinal plants we recommended is comfrey, which works great for bruises, sprains, strains, and breaks. St. John’s Wort is also a must-have as it works wonders on bites and burns. It is works great as an antibacterial and anti-inflammatory plant. If anyone in your family has asthma, it would also be helpful to plant Horehound. It’s very useful in treating sore throats, congestion, and colds. If you have more than enough plants and vegetables set aside for yourself and your family, you can sell the rest. Some of the best plants to grow and sell include tomatoes, peppers, herbs, and broccoli. If you’re already drying and saving your own seeds, you can repack them and sell them in sets of tens and twenties. The extra cash you earn could come in handy during emergencies. You can also use the extra vegetables and fruit to barter for other goods you need in return at a nearby farmer’s market. Turns out plants don’t only help clean the air you breathe; they can also be a good source of energy. A team from Cambridge University harvested energy produced by plants through designing specially adapted vertical green walls that collect electrons from plants. They are a natural by-product of photosynthesis. In the event of a widespread blackout, the energy you harnessed from plants could come in handy to light your house or charge up your electrical equipment. If you have a big garden, it is the perfect place to build an emergency shelter—and it’s not as hard as you think. Former plumber Colin Furze from Stamford in Lincolnshire showed the BBC how easy it is. “It’s a metal box in a hole – if you can weld and cut bits of metal then you can make one—the actual mechanics of it is quite simple, but it’s a huge project,” he said. It took him two months to construct his 10-feet deep and 20-feet wide ‘apocalyptic bunker’. 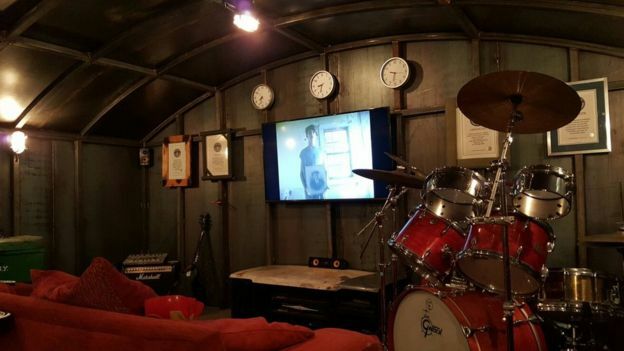 His bunker was a concrete-covered den with a flat-screen TV, a drum kit, and several video consoles. These simple benefits are proof that you really need to make sure your garden is always safe and well taken care of. For one, you have to be diligent when it comes to keeping pests out of your garden. You can use organic pest control solutions for common garden pests like slugs. But when it comes to animal pests like rabbits, mice, and foxes (especially if you keep livestock such as chickens) you need to make sure you have durable and quality fences to keep them out. The expansive range of garden fences featured on Screwfix show how many of today’s designs are pressure-treated to help protect them against the weather. They can save you money and time, as you won’t need to keep replacing your fence panels. And the way in which they keep your garden safe from intruders will help safeguard your plants and vegetables throughout the year. Your garden can also help keep your home secure. You can install smart devices like motion sensors that will start recording, and alert you, whenever they detect any movement in your garden. This will help keep you and your family safe. Who knows, by following the above tips your garden might just save your life in the future.